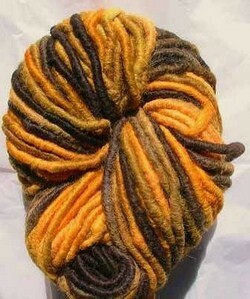 Yarn of rare beauty from a rare breed of sheep. Renowned for centuries in Britain for its beauty and utility, Cotswold wool production funded the construction of the great cathedrals and churches, and literally helped England become the country it is today. Cotswold sheep were introduced to the US in the mid-1800s. 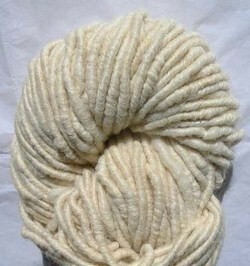 Cotswold wool has long been referred to as "the golden fleece" both for its creamy color and its great value. Usurped from favor in the early 1900's by the fine wools and other causes, the Cotswold breed dwindled to near extinction. Resurrected at the very brink, the Cotswold today is enjoying a comeback, but is still considered rare by The Livestock Conservancy - meaning that there are fewer than 1,000 annual North American registrations, and estimated fewer than 5,000 purebred animals existing worldwide. Borrowing from the "golden fleece" legend, we are pleased to offer "Golden Sheep Yarn" © - 100% pure Cotswold wool yarn exclusively from our flock. Fleece from our Cotswold sheep flock is carefully skirted and sorted by hand to ensure that only sound, clean, long-stapled fiber goes into our yarn. 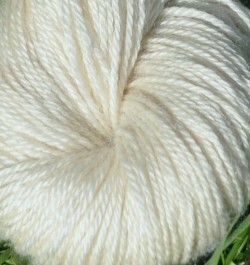 The natural white yarn is not snow white, but rather a warm cream or ivory color. My brother calls it "candlelight" and I think that's the perfect description of the color. Our Cotswold yarn is milled by Stonehedge Farm and Fiber Mill whose expertise with long-stapled fiber really highlights the natural luster of this lovely long wool. 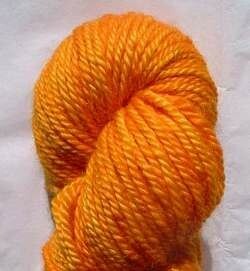 Sometimes called Poor Man's Mohair, Cotswold has arguably the most shine of all wools, and takes dye wonderfully. 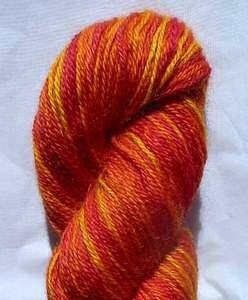 It is a strong, supple yarn with a feeling of substance to it, and will drape nicely. 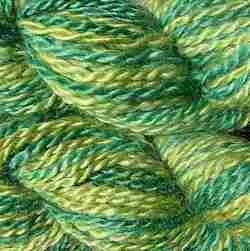 Our yarn is currently created in two weights - a 3-ply bulky and a 3-ply sportweight. 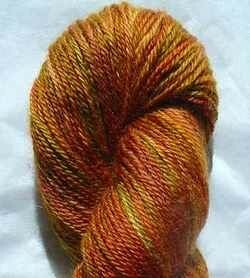 There are also a few skeins listed of prior, different weights. Solid medium gray with high luster. Rich, almost metallic looking. 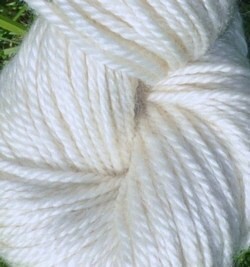 Natural creamy white, high luster. Hot cherry red, orange and blips of bright yellow. Hot! 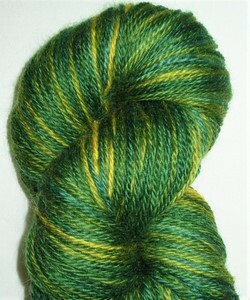 Deep spruce green shading up to olive. Warm shades of walnut, pumpkin, olive and wheat. I love this colorway! Buttercup yellow and light blue with short blips of green where those colors blend. Natural creamy white, squishable but sturdy, high luster. Orange, lemon and tangerine shades. 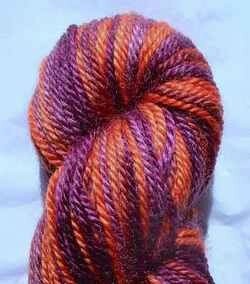 Got a little crazy here - salmon/orange with burgundy purple - send in the clowns! 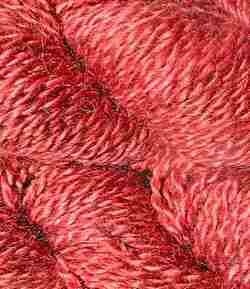 A bit darker red than this - more of a primitive red. Dark and light greens together. 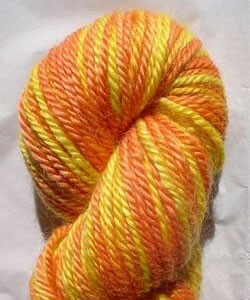 Core Spun "Gosh Darn Big Yarn!" 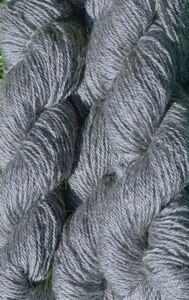 Core spun yarn is created by wrapping fiber around a central thread. 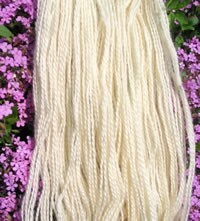 In this case Cotswold wool has been applied to a cotton cord base. 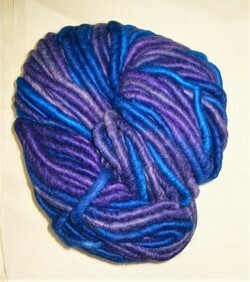 This yarn is super chunky, "squishy", lustrous, strong, and has just about no elasticity so it won't stretch. Use in weaving, crochet or knitting (size 17 needles work well) to make mats, rugs, trivets, baskets or the popular uber-thick wearables! Shades of wine and crimson. Dark chestnut, golden straw, hot salmon. Warm orange shading to dark brown/black. Jewel tone blues, lilac and purple.